Today’s guest blogger is Staci. 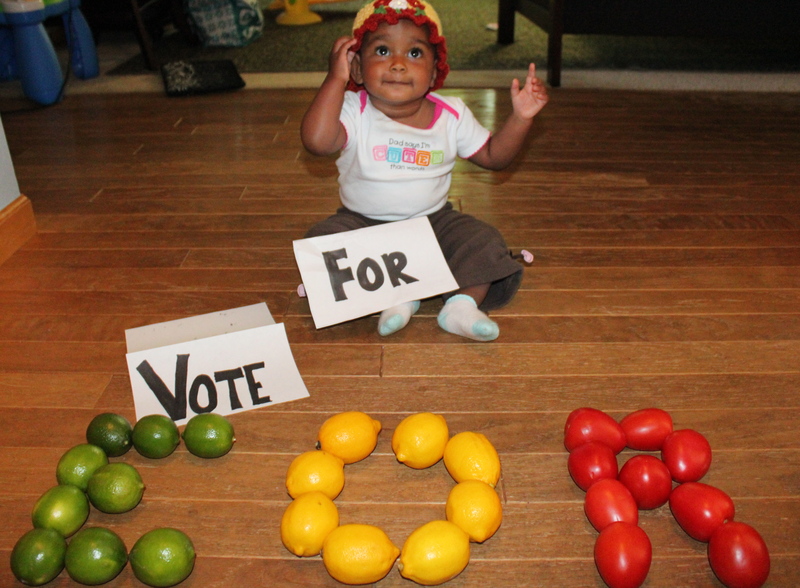 Here at EOR Staci is always one amazing supporter. From our pleas for dresses being made for the girls in Ethiopia, to our need for votes in the Classy awards, to her generous donations, Staci is a constant supporter of EOR and we are grateful for her! To read her personal blog please visit here. I recently wrote on my personal blog about the burden of knowing. How when our eyes are opened, when we see and vicariously experience what human suffering is, it is hard to live with that knowledge. Why? Because the mantle of responsibility is heavy and descends swiftly. I think we humans know this, and so when we see titles of news articles about people starving in a far away place, or experiencing violence, we don’t want to see it. We turn the page, close our eyes and tell ourselves we will read it when we are in a better emotional place. I don’t want to be depressed today. We don’t want to face the staggering numbers, the stark reality, because the burden of knowing often makes us feel badly. For example, you, or I just bought our kid $30 new shoes. We don’t want to feel badly about it, his feet are wide, inexpensive mock brand ones don’t fit, the used children’s store is far away, and Zappos has overnight free shipping. It is what it is, right? Why should we have to fuss about it? Or we just signed our daughter up for dance classes. $70 a month. We are excited about it, it’s going to be wonderful, we don’t want to think about how far that money would go in Ethiopia. Or we just went on a date, $30 babysitter, $40 dinner, it had been a long time, we wanted to go out…we don’t want to feel badly, darnit! When we know what is out there, facing it in its horror involves emotion, a little guilt and it is not a comfortable juxtaposition to question what we spend, what we spend it on, and why when set against a backdrop of this Knowledge. We want to live our lives free of this heavy burden. I have tried to shut it out, turn it off, not think about it, not click on the links to news stories, or first hand witness’ accounts of what is happening in ___________. But strangely, this doesn’t relieve the burden. As if there were a yoke on my shoulders, weighing me down, the burden grows more and more. I feel like I am wearing a Scarlet Letter, H, emblazoned on every shirt for all the world to see, where H stands for Hypocrite. And though I know no one can see my conflict with what I know is the discrepancy between “where my heart is” and where my “treasure is” I know it is there, and the feeling gets heavier and heavier until I must do something. I start dreading the mail for the Sundance Catalog will surely be singing its siren song telling me what I need to feel happy. But know it’s a lie. My burden would still be there, all the heavier. There is only one thing to be done: put my money where my mouth and really, heart are. In the same moment wherein I write the check, or click “send” for an online donation to aid fellow humans, I feel my burden lessened. It is a tangible, visceral feeling, that when when I offer relief, I receive it tenfold. I am grateful to Ethiopian Orphan Relief for reminders about what projects they are working on, and what they need, and giving me the occasional privilege of seeking relief through their wonderful organization. These adorable tots are 3 of the 4 kids Staci and her husband have in their family. This month EOR is going to have several guest bloggers. 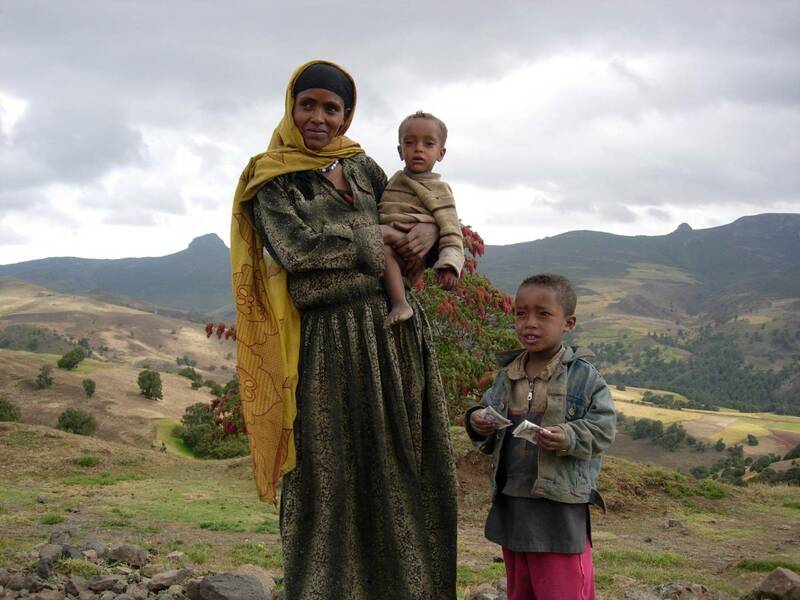 We are thrilled that our supporters want to share with our readers their love of Ethiopia. Meet Vivianne our guest for today. Thanks Vivianne for sharing your love with the girls at Children’s Heaven. When I was asked to be a guest blogger for EOR I was deeply honored, EOR holds a very special place in my heart! Then I realized how hard it was going to be to pick a single subject, there are so many things that I love and want to share about Ethiopia! I have always had a deep respect for Ethiopia, for the history, its rich culture and for the people’s perseverance despite their daily struggle. 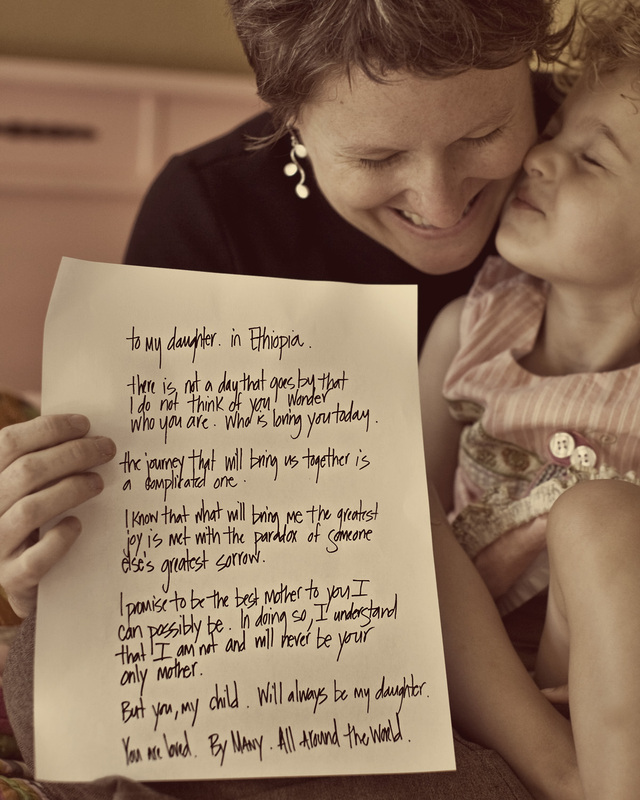 However, now that our daughter is from Ethiopia, our hearts are even more attached to this beautiful country. The first time I was introduced to EOR was through Lights of Hope in 2010. We were five months into our adoption process and had a deep desire to experience anything that had to do with Ethiopia. I went to the event with an eagerness of hearing about projects in Ethiopia, and left with deep respect and admiration for both the people of Ethiopia AND EOR. I admired EOR for being adoptive mom’s wanting to make a difference. I was inspired and wanted to be an instant cheerleader for these amazing ladies and their vision. EOR is not only been a place where people are able to assist in giving back to the beautiful, yet vulnerable children of Ethiopia, but EOR is also a place to meet some amazing people who want to make a difference in whatever capacity they can. The story that stayed with me the night of LOH2010….in 15 minutes EOR was able to raise enough money for 100 girls at Children’s Heaven to eat for 500 days. I had tears in my eyes watching the compassion and generosity explode in the room that night. From that night on I knew what an incredible impact EOR is able to make! 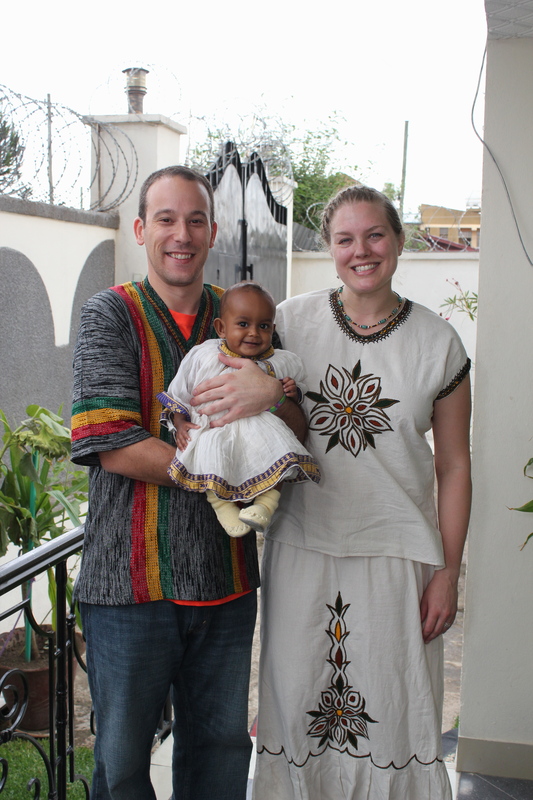 We traveled to Ethiopia in March to meet our daughter. We were lucky enough to spend two months in Ethiopia. Since we had our daughter with us for 7 of those 8 weeks, we had to limit our travels to day trips, however we were still able to the breathtaking countryside and meet some incredible people along the way. I have too many memories to share in such a short time, but there was one memory that will forever be in my heart! We were priviledged to visit Children’s Heaven, the very place that captured my heart that night back in May 2010 at Lights of Hope! We were invited to attend their saturday program where they sang, played games and shared their delicious traditional food with us for lunch. It was a touching experience to spend the afternoon with these beautiful girls, to hear their singing and laughter while they were playing brought tears to my eyes! By watching their displayed happiness you wouldn’t know of the heartache and struggle that they live with on a daily basis. Children’s heaven gives them support and a place to go to be a young girl, forgetting just for that moment about their obstacles. Because Children’s heaven provides them with lunch they are able to focus at school instead of wondering if they will be fed that day. We thanked them for allowing us to be a part of their saturday program, but I don’t think they will ever know how deeply they touched our hearts, forever! For our daughter’s first birthday we plan to sponsor a girl from Children’s Heaven, and we plan to only continue giving over the years. Thank you EOR for the generosity of the financial and emotional support that you provide to these precious children throughout Ethiopia! Even though Ethiopia is half way across the world you help us feel connected and give us an opportunity to continue our efforts to give back to Ethiopia! A number of months ago, while Gabriel was in Sunday school, the rabbi at our synagogue asked all the parents to stay for a short talk on raising Jewish kids. Since it meant I was going to miss some quality coffee and pajama time at home with Kevin and Clementine, I hadn’t exactly been looking forward to going. Once the rabbi got talking, however, I found myself digging in my bag for a pen, wanting to write down every word he said. He presented a top 10 list for raising Jewish kids–note, Jewish kids, not necessarily spiritual kids. He didn’t promise that the tips would help us raise kids who feel connected to God but he thinks that, if you follow these 10 recommendations, you stand a decent chance of giving them some of the tools they’ll need to potentially tap into their own spirituality as they grow up and mature. Part of the reason I wrote so furiously over the course of the next hour was because I immediately saw how a list of ways to impart a sense of Jewish identity in my children was not very far removed from a comparable list of ways parents might reinforce their internationally-adopted kids’ cultural identities as well. 10. Have Jewish “stuff” around the house. Don’t just pull it out once a year to celebrate a holiday but keep it out where it blends into the fabric of the household. Just like menorahs, mezuzahs, haggadahs, Jewish art, and children’s books with Jewish themes all reinforce children’s religious identities, the same types of purchases and thoughtful placements around the house can reinforce their cultural ones. 9. Think of religious school as an education that doesn’t end at bar mitzvah but rather goes through high school. In the adoptive playgroups we have taken advantage of (and even helped establish) for our own kids, I can sense that it will get harder and harder to get scores of kids together, especially as they grow older. As their homecomings fade into the distant past and children make their own school friends, relying less on their parents to arrange their social interactions, I can see how it’ll fall to us as parents to keep prioritizing these activities and, ultimately, friendships. 8. Come as a family to synagogue on Rosh Hashanah and Yom Kippur. Take off work and keep your kids out of school. For those of you who aren’t Jewish, this may seem like a silly one. Like, really, we need to be told to go to temple twice a year? Ummm, yeah. We Reform Jews don’t always make it to synagogue as often as we should… that whole Friday night thing is a bit of a hindrance. Plus, regular Friday night services start at 7:30, which would just be hilarious to attempt with Clementine. What our rabbi’s really getting at here… celebrate the holidays. Make them a big deal, even if you do nothing else throughout the year. I’m guilty lately of barely acknowledging our own American holidays, let alone those in Guatemala and Ethiopia. I’d like to get better at this. 7. Observe birth, adolescence, marriage and death in a Jewish context. Assume you’ll do it that way. Kevin and I had a Jewish wedding despite the fact that Kevin’s not Jewish. We held a Bris for Gabriel soon after we adopted him. I’m a little consumed with the whole Greece thing right now but, mark my words, a naming ceremony is in Clementine’s not-so-distant future. In other words, we’re raising a Jewish family and we do assume that we’ll mark life’s largest moments in a Jewish context. A bigger question for me is, “What would it even look like for us to observe those same moments in an Ethiopian context? A Guatemalan context?” That tells me I need more education. 6. Belong to a synagogue until you die. 5. Observe Rosh Hashanah, Yom Kippur, Chanukah, and Passover at home. During Passover, have a Seder. Eat matzoh all week. A translation for adoptive parents: do the work. Making a Passover dinner is really hard. It’s like Thanksgiving or any other meal that winds up tasting better, the more hours you put into it. It’s easier not to do it. This past year, Dad had just died and we pretended the holiday didn’t exist. One year, when Kevin and I were newly married, we went to our old synagogue’s Seder because I was intimidated by boiling water, let alone cooking lamb. The dinner was sort of lame, and it’d have been better if I’d put my big girl pants on and invited a few friends over to enjoy a meal I’d cooked. I’ve yet to cook an Ethiopian meal. It’s time to get out the berbere. 4. Send your kids to Jewish summer camp. Just like there are tons of Jewish summer camps out there, there are a growing number of cultural camps designed to help kids, and even entire families, learn about and celebrate their birth cultures. Kids either love camp or they hate camp, and there’s a good chance that my kids will grow up moaning about the year (or better still, years) Mom and Dad sent them to culture camp… but maybe, just maybe, they’ll forgive us because they’ll figure our hearts were in the right place. 3. Plan to give your kids a high school Israel experience. I went to Israel for the first time when I was 26. I went through the Taglit/Birthright program, which provides free trips to Jews in the diaspora, ages 18-27, who have never been to Israel. The program is really well conceived and executed and it’s wonderful that it’s there but I think that, if I’d known more about Israel at a younger age, I might have made slightly different choices during those pivotal college years. Who knows? A lot of people say that the ideal time to take a child back to see their birth country is at around age 12, when they’re (hopefully) not yet so jaded that they completely hate hanging out with you:-) Yet, at the same time, perhaps they’re old enough to really remember the experience and feel the full impact of the trip. We took Gabriel back to Guatemala when he was four, with the full knowledge that he wouldn’t remember anything. Truthfully, Kevin and I had really missed it and just wanted to go. We know we may not be able to make a habit of popping down to Guatemala (or over to Ethiopia) every four years but we figure that, at the very least, we’ll do a family trip to each country sometime during their teen years. Our end goal is for both our kids to grow up feeling like their birth countries are accessible to them. 2. Have your kids participate in a Jewish teenage youth group. This one relates directly back to #9. As our kids age out of playgroups, we need to find ways to build in socialization time with other kids who share their heritage. 1. Regularly observe Shabbat at home. Shabbat (which we don’t observe… shame on us!) is about ushering in the sabbath, the day of rest. It’s about spending time with family. It’s about prayer. And quiet. And contemplation. Observing Shabbat every Friday night is about making time in your life so the spiritual stuff can happen. So maybe I lied when I said this list was about raising Jewish kids and not necessarily spiritual ones. Doing all the stuff on the list is good but finding a little quiet in each week to really listen… to the silence, to your kids, to what they’re saying, to what they’re not saying… that might be where it’s all at in the end. Thank you so much, Rachel, for sharing your post with us! I hope that all of you comment about ways you keep a connection to your child’s culture too. Little tips, big ones–please share! Another fabulous guest post, this one from my sweet friend Emily. Em has chronicled the adoption process and her first few months at home with her darling boy, Ezra, at Our Little Buster. Emily spends a good bit of time thinking and writing about attachment; this post is a beautiful example. Thank you Em, for sharing it with us. Long before I became a mom I marveled at how a mother could make her baby stop crying by just holding him. I think everyone has witnessed a moment where a family member or friend is holding someone’s baby and the baby starts to cry or fuss. That person will then hand the baby back to the mom and instantly the crying stops. The baby feels safe and secure again just from their mother’s touch. I always thought that was beautiful and wanted to be that safe and secure person for a child. As an adoptive parent, I knew that it would take some time and some work to get Ezra to that point. I would say Ezra felt safe with us from fairly early on but I am not sure that he actually preferred us or that we were able to provide true comfort when he was upset. Several of my adoptive mom friends told me to give it time and that it would come. Patience is not one of my strengths and I so longed to be Ezra’s person of comfort. Waiting for those signs of attachment has been hard. Last week I took Ezra to his 9 month well visit at the doctor. I knew he would be getting more shots as our doctor explained that at our previous visit. When we went to the doctor the first time we were able to get him to calm down with a bottle. He cried until we got to the waiting room and then as soon as he had the bottle he was fine. For this most recent visit I was taking him by myself so I had the same plan of attack. The nurse came in to give him his shots and I started to get the bottle ready. Of course he started screaming while he got the shots and then the nurse picked him up while I finished pouring the bottle. He continued to cry as the nurse held him. I got my stuff together and the nurse handed Ezra back to me. I fully expected him to continue to cry until I got that bottle in his mouth. Do you know what happened? He stopped. He looked at me and sniffled a bit but he stopped. The nurse said, “Well, look at that. He just needed his mama.” I almost gave the nurse a hug. I held him tight and hugged him and he was back to his silly self. I was his person. And it felt amazing. Another fabulous guest today. Bridget writes elegant thoughts and shares gorgeous pictures at Sticky Mango Feet. I’ve been a fan for ages, but a relatively silent one, so I was a little hesitant to ask Bridget to write for us. I’m so glad I did! Here are her thoughts on ‘the wait. In September of 2008, I made the mistake of telling my hairdresser that we were adopting. Little did I know then that the 25+ months that were ahead of me would be some of the most challenging months of my life. Every month thereafter when I went to get my hair cut (short hair has it’s drawbacks, folks! ), she would say, “Soooo…..any word on the adoption?” Groan. I’ve been to five hairdressers since. You’d think I would have learned my lesson the first time around. Keep your “news” quiet, woman! But, I can’t. Our child, who I do not know yet, is still our child. She feels very real to me. So, when someone asks me, “How many kids do you have?” I reply that we have a 3 ½ year old daughter and that we also have a daughter in Ethiopia who we do not know yet. The predictable questions follow and I (usually) politely reply. I mean- they’re just curious, well intentioned people after all. This last weekend we attended a Halloween party and three seconds after we arrived, someone yelled across the room, “Any word on your adoption?” I love her. I do. But, I wanted to yell back, “Any word on your ex?” I busied myself with my daughter’s costume and pretended not to hear. Sometimes, it is just too painful to answer. Because my answer is “no.” There is no word on our adoption. And for the last 698 days I have awoke thinking of her and for the last 698 days I have fallen asleep thinking of her. I’m not as bitter as I sound. I promise. I know I shouldn’t equate our “wait” with someone else’s painful journey. We all have something. It’s just exhausting. Lately, I’ve been saying to people, “It’s (the wait) just too long.” I don’t think they understand and how can they? My words are vague and they sound overly simplistic for the angst that I feel. I have spent the past 698 days trying not to wish away precious time. I am head-over-heels in love with my daughter and love our days together (even if I’ve gone completely mad by 3 p.m. on most days). My husband and I have been drawn together in a new way. We have strengthened our relationship by enduring the pain of the process. It absolutely has meaning. The wait. And yet, 698 days to wait for our daughter to join our family…it’s a long time. I need her home. I need her in my arms. I need to start the journey together. I know it is a journey full of challenges, hurdles, complications, more angst. I know. But I’m ready to begin. I’ve spent the past 22 months reading, blogging, going to classes, attending webinars, meeting adoptive families, connecting with other mothers who “get it.” I’ve poured over conversations of ethics and transracial parenting. I’ve searched for truths, all truths. I’ve tried to learn all I can about Ethiopia and her people- a country I have grown to love from a distance. A country I already love intimately and without reservation even though my feet have yet to meet her soil. I’ve cried. Oh, how I’ve cried. I’ve cried and cried and cried and cried. I had no idea the grief I’d process throughout the wait. And yet, I know I have not even experienced the tip of the iceberg, as I don’t even know our daughter’s story yet. I haven’t met her. I haven’t met her birth family. I’m naïve. I know this. I was when I first started this journey and although I have learned so very much, I know I have so very much yet to learn. I am committed to the journey. I now look at the world in a much different way. Adoption has changed me. And even though our wait has been tremendously difficult, I wouldn’t change it for the world. I know that our joy is someone else’s sorrow. I don’t wish this upon anyone. In a perfect world, adoption would not need to be an answer. Alas, we do not live in a perfect world. In the next 2-3 months, we will have an answer to our question: Who is she? And we will have a lifetime together to continue answering that question. We will have a lifetime together. A lifetime pales in comparison to the 698 days that we have spent yearning. And so, we wait. Because waiting means seeking, understanding, learning, questioning, grieving, celebrating. Eventually, the day will come when we will know who she is. We will know her story. We will be the honored ones to spend our days with her. I know that months are nothing compared to a lifetime. And it is, in a way, selfish to be so exhausted by the wait. I need to remind myself of that. Daily. I’m sure most of you are well-acquainted with Cindy, the mother of the ever-delightful of triplets Bereket, Sira, and Tsega. If you haven’t joined the fan club, run to her blog, ethiopia tripletland and join in the fun. 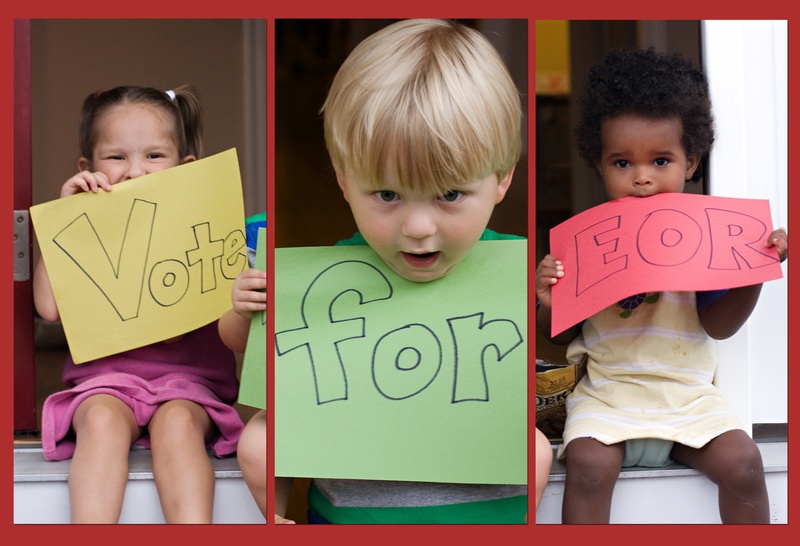 Our very favorite videos of other people’s tots are always on Cindy’s blog. Astrid Meklit is besotted with the three of them. I start the flight to Ethiopia drunk. My husband Jerry and I are beyond giddy which seemed to climax at a DC lounge. We were about 15 hours from Ethiopia and two weeks from completing the adoption of 5 month old triplet boys. By Rome, during our touchdown for jet fuel, I was swooning. My head hurt, I wanted to throw up, and I started making trips up and down the aisle every 15 minutes with a bad case of stomach nerves. But worse, I was suffering the start of a 2-day panic attack. I return to Ethiopia as tourist only. I am traveling with my mother. I free my children from my mind but open my nervous system for details. This time I will experience more religion and history and cover more distance; first east to Harar, then north to Lalibela. My role in our mother-daughter duo is leader. I adjust expectations, make sure we don’t get lost, get what we need, know what’s happening, and write everything down. I know how to navigate our travels and do not get sick on the plane. We are landing in Africa. I know well the sensations of Sub-Saharan African culture shock and waited for this short-lived stage to take over. Babies, however, this was a new shocker. Anxiety and claustrophobia hit hard. Despite all the desperation of infertility, miscarriages, disappointment, red tape, and long stretches of waiting time, I was suddenly in no hurry to meet our new sons. I feel relief that our first week in Ethiopia will be spent traveling away from the care center that fosters our babies. Our first day in Addis Ababa, I am itching all morning to get out of the hotel. I almost run up the street to shake this suffocating feeling. Finally out driving, we are crossing the city on Bole Boulevard waiting in traffic. Like out of nowhere, this guy is waving an 8-digited hand at my car window. I flinched hard and might have screamed. I remember feeling icy inside. Like a ghostly line up, he was followed by a showcase of the disfigured, handicapped, and impoverished: blind, crippled, twisted bodies that rolled on skateboards, backs encased in tumors, all cupping their fists out for duh, money. I’ve seen this before, buy my body reacts strongly. I feel like crying. I am in Addis again and feel good. I recognize hotel workers and drivers. The capital looks different through my new eyes. Richer. Sexier. Exciting. Busy with commerce. There is still extreme poverty and pollution, but destitution is not all I see. I think how stupid it was that my first impression failed to notice the number of well-to-dos on their way to work, running neat shops, dining out. I begin to recognize many of the street beggars as we pass them everyday, but this trip I notice fewer. I catch them laughing, talking, playing jokes. I pass birr notes outside car windows to them and feel guilty for doing so stupidly little. Human beings, somebody once said, can adapt to anything. Driving through the southern highlands to the Bale Mountains, there are no unpopulated spaces. Kids crowd us each time we leave the car. They ask for pins. Mothers stare. Teenagers sell us goods. It’s fascinating, we banter, exchange humor, pleasantries, yet I’m tired from losing my personal space and solitude. I can’t find a bush to pee behind unless I run fast from the car and yell at children to go away. I’m laughing when I do this. The landscape is at times beautiful, green, and lush, and we pass many fields of teff ready for harvest. We study the agriculture, wildlife, landscape. We learn cultural, political, historical details. We camp in the cold and foggy Bale Mountains and it reminds me of the Pacific Northwest. We ride horses and see baboons, wart hogs, nyala, and mark up our bird book. The wart hogs are oddly docile here. We meet gracious exciting people. I have exited culture shock. My eyes are different. Now I am up for anything, including motherhood. The remainder of our trip we hole up with our new family in the company of other newly formed families. We are by now acclimated and patient as we grow more tired with less sleep and more illness. We walk slow and heavy with our new children, like in a sea of molasses, and forget to hurry. I wish the honeymoon would not end and I don’t want to go home. 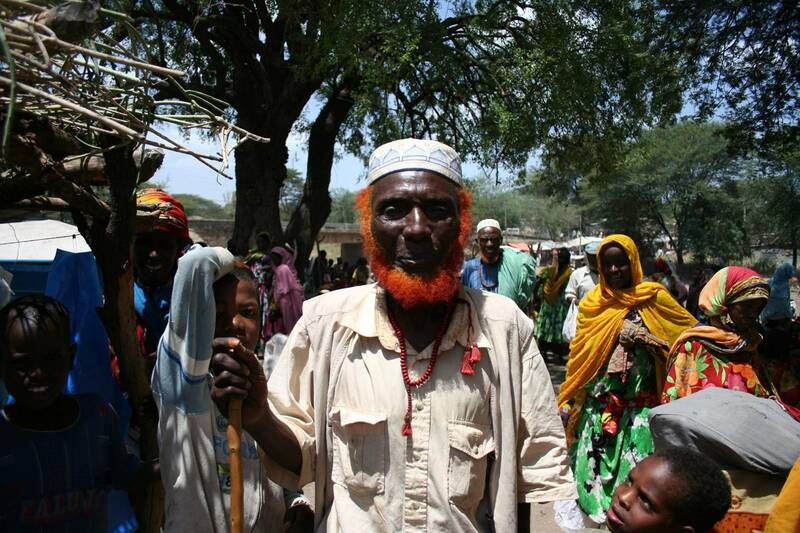 We are driving east to Awash National Park and onto the Muslim city of Harar near Somalia. Fields of teff are maturing but still green. The land becomes dry, volcanic, hot, and strangely unpopulated. This is Afar country. I can pee anywhere and nobody sees me, there are no crowds, the culture is more reserved. I like this solitude. We see monkeys, warthog, oryx, and caravans of camels. Here I scare wart hogs from the bush. Our guide names every bird for me. The look from Afar people cuts me like the knives they sling. Young men wear their hair long. They are proud, decorated, and beautiful. A few days later we leave the wild solitude of Afar and travel the eastern extension of the Ethiopian highlands to Harar. The land becomes cooler, fertile, with more relief than Awash. The slopes are dotted with chat bushes. This is chat central: growing, selling, exporting, consuming. Some have lost teeth to it. I find the taste bitter and its effect mild, but I do not chew much. The atmosphere is lively as we enter the walled city of Harar. 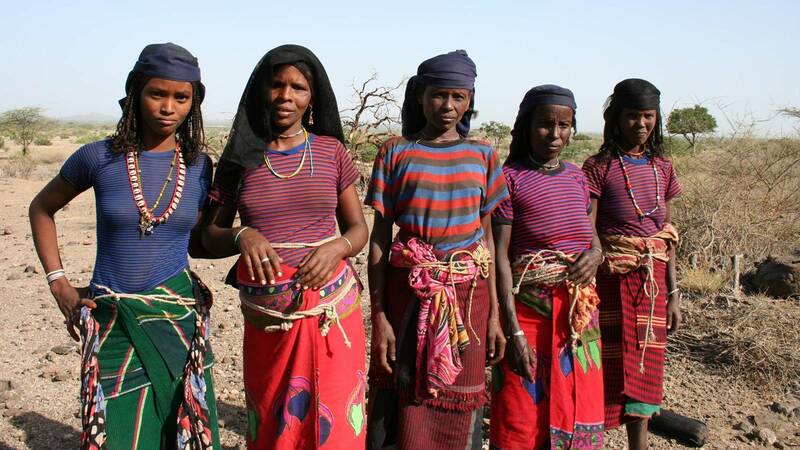 Oromo and Harari women dress in beautiful bright cloth for market days. Inside the walls, history and religion, painted concrete, vibrant colors, mosques, alley mazes, and cobblestone mix strangely with modern eateries, loud pop music, traffic congestion, overpopulation, chat consumption, and a hint of lunacy. We spend our nights closed up in a traditional Harari house. I feel strange and melancholy like the midnight cry of the hyena outside our window. Why did I come all this way to a weird place? 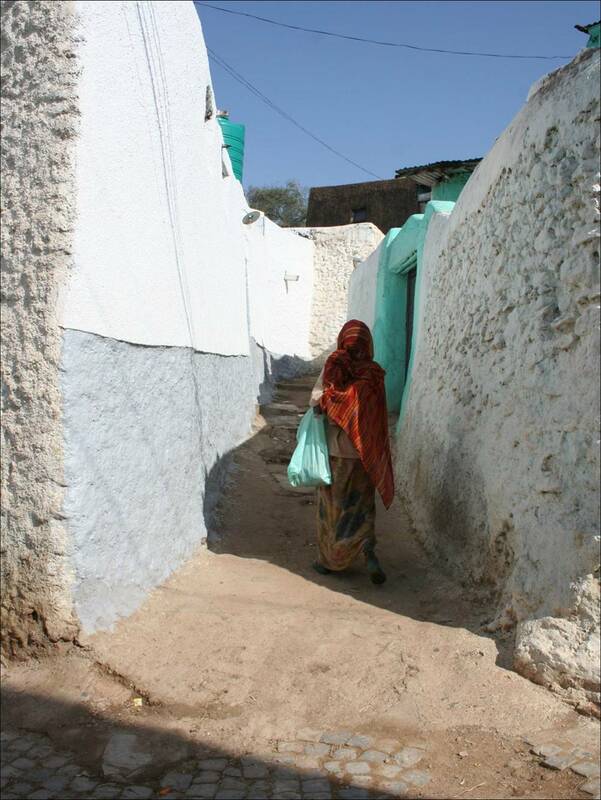 Harar reproduces a painting in my head: Mystery and Melancholy of a Street. The painting depicts a shadow of a girl twirling a wheel down a lonesome street. You feel the shadow of something around the corner and it might be nothing or it might be menacing. By the time we leave Harar, the day after watching the nightly hyena feedings, a sense of color and vibrancy dominates my memory. I decide there is nothing menacing around the corner and now I realize of all my Ethiopian travels, Harar perhaps had the biggest impact (so far). 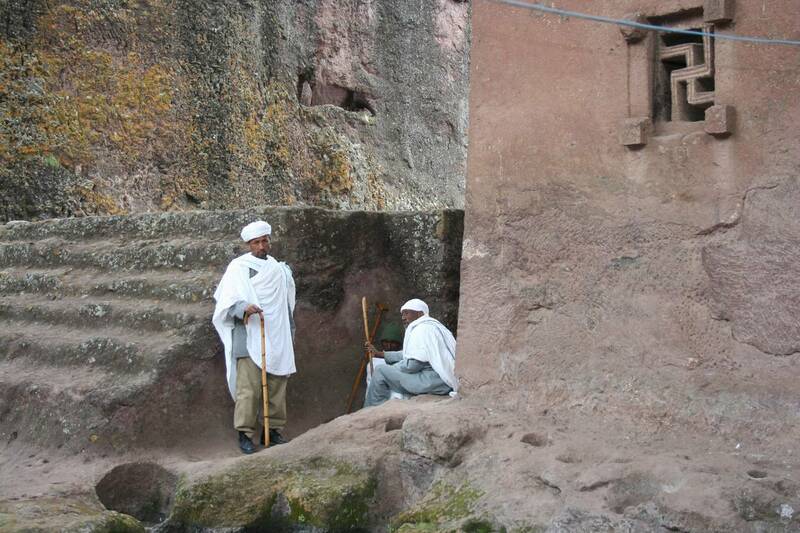 Mom and I finish our duo in Lalibela, the only city we experience in the northern historical route. The details of the mind blowing craftsmanship of the rock-hewn churches are too much for one camera and one memory. I am barefoot and leading my mom arm and arm on rocky, uneven floors through churches that challenge her bad ankles. We move slow. On the hike to Yemrehenna Kristos cave church, we hand out birr notes to a line of almost entirely blind beggars. Our guide encourages this, points to the needy ones I have missed, but we both agree that handing out money and things to children who ask out of habit rather than need corrupts culture. I made this mistake in 2006. The line between right and wrong waves in and out and I still feel stupidly impotent. Today I wonder when our next trip to Ethiopia will be, when we will take our children, how we will find the money. I hope we are there soon and I find myself wandering the Omo River Valley. Thank you so much Cindy, for sharing your voice (and your terrific triplets) with us. I got involved with EOR because of my beautiful niece Meron who was adopted from Ethiopia 3 years ago. I had such a fantastic time at the Lights of Hope event last year that I can’t wait for the 2nd Annual Lights of Hope event on May 8th! Some of the words that come to mind to describe Lights of Hope are Fun, Excitement, Energy, Generosity, Awareness, Caring, Community and Inspired. EXCITEMENT: about all the amazing items in the live and silent auction (and hoping to win). ENERGY: because of all the positive thoughts, words, and feelings that were expressed throughout the night. GENEROSITY because of the amazing amount of generosity during Raise the Paddle. AWARENESS: because this event helped raise awareness of how many orphans need our help. CARING: because so many people showed how much they care about making a difference in the lives of children in Ethiopia. COMMUNITY: because of all the wonderful people who came together this particular evening and really made a difference. INSPIRED: to make Lights of Hope a greater success every year. Thank you so much Emily for being such an integral part of Lights of Hope and EOR. With your help, we raised more than $30,000.00 and this year, I know we can do it again. I suspect like many prospective adoptive parents, before I took a pen to an actual application from an actual agency to actually adopt, I encountered the wide world of Ethiopian Adoption Blogs. 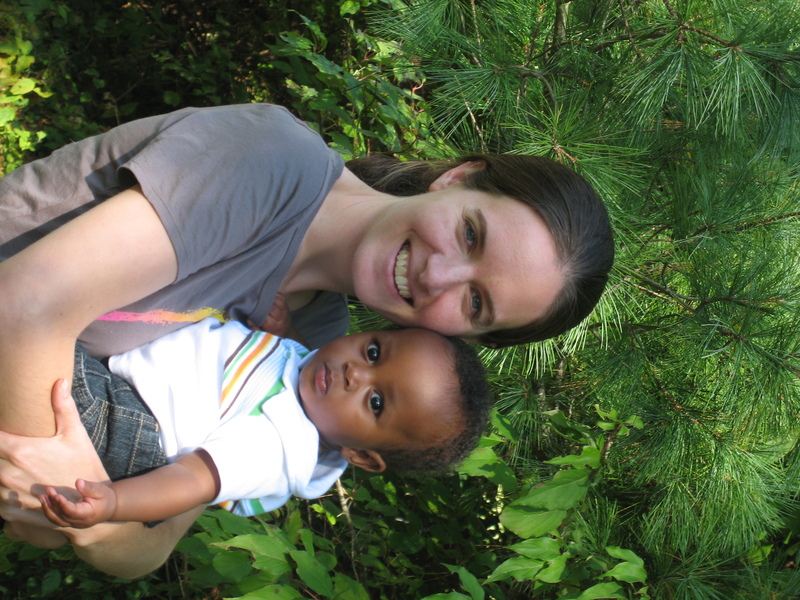 Googling “ethiopian adoption blog” first led me to blog royalty, like Mary from Owlhaven, Melissa Fay Green, and long before her referral, Julie from the Eyes of My Eyes Are Open. I was also particularly fond of Straight Magic, and Habesha Child. Then I found Kristin J Photography and that clinched it for me. Her images of a family meeting their little one brought me to tears and I knew this was a group of people I wanted to be a part of. No, we didn’t decide to adopt, or even adopt from Ethiopia because we wanted to join a club — though I’d be lying if I didn’t say I think ET adoptive families are among the greatest people on the planet and I would be proud to be counted in their number. 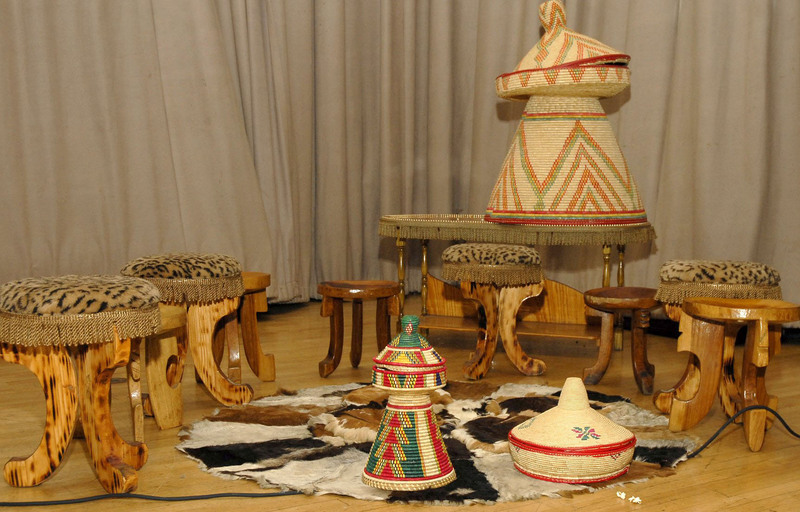 But as we grew in our resolve to adopt and fell in love with Ethiopia, it was the blogs of real people who were living the journey of international adoption process, or had completed it and were now charting the waters of parenting children of a different heritage and often race that made it all seem doable. I found constant inspiration in my lurking. Until lurking wasn’t enough anymore. I had to comment. I had to beg for a lifeline. I wanted to connect to these bloggers. I wanted them to know I was alive, just as I knew they are alive. I wanted to share in their journeys and I wanted them to share in mine. Even in the best of circumstances, when blessed with loving and enthusiastic family and friends, nothing can replace being able to talk about everything international adoption entails with someone who GETS IT. And no matter how much empathy our parents have, how many thumbs up we get from our friends, sometimes they say insensitive, or subtlety racist things. Early on in the process or waiting game, we PAPs start feeling the onus of being examples and teachers of sensitivity to the people in our world that love us, but are not living and breathing adoption on the level that we are. They are not taking the classes, they are not reading the books, they are not learning from other adoptive families. They are not keeping up. They care, but they don’t always get it. They try but they might never say things exactly the right way, or understand without explanation which questions are not appropriate to ask. I never imagined that the sneaky education I’d been receiving from fellow bloggers’ experiences would transform into one of the most important social and emotional resources of my life. Ethiopian adoption bloggers are a lifeline for me. Through blogging I have found other adoptive families living in my area. We might never have connected without blogs. I’ve waited with them, cried with them when they received their referrals, jumped in the car when I received the “green light” to come meet their sweet new little ones. I have felt supported and buoyed up in the highs and lows of my family’s process. The best thing in the world is meeting a virtual friend in real life, and being able to hug a person who you’ve cared about for a year or two. I would say one of the most important examples I’ve been shown through this network of adoptive families is how to literally walk the walk and put your money where your mouth is in regards to caring for orphans. I didn’t even know what sponsoring a child meant until I heard about it on other adoptive families’ blogs. I am so thankful for their goodness and examples. 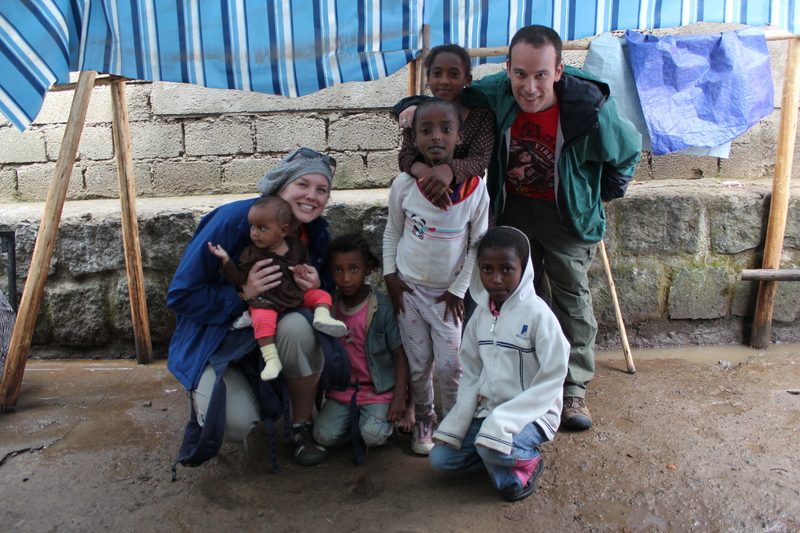 A lifelong connection to Ethiopia is so important in regard to these little souls we transplant into our families; what better way to keep the fire alive than through humanitarian work like that done by EOR? Our family reached a low point several months ago. We were living la Vida Adoption, pleased as punch with our agency, and things were going well. All of a sudden, I received the shocking news that I was very unexpectedly pregnant. I won’t write about that here, since I have written plenty on my blog about why this was not ok -at first- and what it did to all our glorious family planning. But I will say that it was devastating to put our adoption on hold. On top of major health concerns, I was afraid that becoming pregnant would alienate me from my support network, since many of us who choose to adopt do so because of fertility issues. I underestimated the blog world. The people who had been my confidantes and cheerleaders during adoption were just as supportive and kind when they found out I was expecting not a little Habesha, but a homegrown baby. Strangely, I have several “real life” friends who I would have considered close, who still have never called or visited once since telling them about my debilitating pregnancy. I have received gifts, calls and a constant flow of emails and comments on my blog from my adoption blog peeps, and for this I will be endlessly grateful. God has been smiling for a while on our little family, apparently He always knew what was going on. Despite an unexpected and brutally difficult pregnancy, and having to place our adoption on hold, a mistake was made somewhere in communication. A glorious mistake. Someone in Ethiopia didn’t get the memo, and matched us with a little one. We were wildly happy to accept a referral of a little boy a few weeks ago, and as our wait has intensified in emotion, I continue to stalk blogs to see how quickly other families’ court dates and travel dates come. Now my urgency to connect has honed in on families using my same agency. In some ways, I have wished I had spent more time finding Dove families sooner over the past two years, so we could be resources for each other. I never realized when it came time to travel, how much I’d want support of folks who have been there, or who are going ahead of me. And how much I’d want to be a source of hope and information for the families that follow us. Dove Adoption Families, I am one of you. Feel free to stop by the ol’ blog and drop me a line! Blogging can seem a silly trend, there are times when we might sacrifice a bit too much time on the internets. But for my family, it has proved to be one of the best comforts and sources of information in our adoption process. We have made real friends, connected with real people. For me personally, the blogging connection has been a bigger deal than I thought. Thank you Stace, for sharing your voice with us. I feel so lucky to “know” you and look forward to the pleasure of finding you on my reader each day. lift EVERY voice and sing…. Terrific volunteer Tracy S. kindly agreed to be a guest blogger for us. She shares her thoughts about Black History Month. I love that the pink mom of pink kids has worked to craft a thoughtful response to this topic. I’ve spent a fair bit of time thinking about Black History Month and how it should be commemorated both as a teacher and as a parent, and in both cases, I knew it was my duty and my privilege to share this history with my brown children and my (mostly) brown students. I’d like to think that I’d feel the same drive in any situation, but who knows how much time I’d put into this topic if my former students or my lovely children looked just like me. Thanks Tracy, for sharing your thoughts. American? They are no less American. and people of color – not just in February.